Per the great Abbott & Costello, "Who" is on first, "What" is on second, and "I Don't Know" is what everyone will now be forced to say when asked how big a failure Obamacare has been in providing insurance to the previously uninsured. The reason? The Census Bureau has suddenly announced that they're changing their long-used survey questions about health insurance, and replacing them with new questions which will make it impossible to compare the new data to historic data, as well as indicating a reduction in the number of uninsured even if no such reduction has taken place, owing to the way the questions are worded. While this switcharoo obviously provides the Obama administration with a very convenient way to deflect assessment of policy failures (such as the early estimates that Obamacare failed to provide coverage to 98% of the uninsured), critics of the president can at least take comfort from the knowledge that the Census Bureau is entirely non-political and wouldn't ever slant the questions in a deliberate attempt to bury the truth. Or at least, they were non-political for over a century while under the supervision of the Commerce Department. But that ended when Barack Obama took office in 2009 and immediately seized the Census Bureau and put it under direct White House control. Of course, the president would never, ever, ever abuse that power and generate corrupt data for purely partisan politics. Yesterday was April 15th, and it was a genuine twofer as far as government suckage goes: it was Tax Day, on which the few are required to pay their "fair share" to support the many or go to jail, and it was also the last (alleged) day for anyone to complete their Obamacare applications until the next enrollment period. Both events struck close to home here at Hope n' Change, and have given us a lot to think about over the coming days and weeks. We can't really give details, other than to say an examination of our income to expense ratio (especially when it came to health insurance and medical bills) is, stunningly, an almost exact duplicate of our drinking coffee to drinking "coffee" ratio. Which, of course, is not a coincidence. There are, happily, some consolations to avoiding (unintentionally, but entirely legally) any taxes this year. We didn't pay for even a single new hollow-point bullet for the freakin' post office. We didn't pay for a single glass of champagne on one of Nancy Pelosi's "official" government flights. Our taxes didn't supply Sandra Fluke with a single multi-ribbed spermicidally-lubricated citrus-flavored condom. We didn't buy a single golf ball for Barry. Nor did we pay for as much as a tablespoon of jet fuel to help Michelle Obama take yet another million-dollar vacation. When looked at from that perspective, Hope n' Change feels pretty darn good about the governmental idiocy, evil, and pork which we personally failed to fund, thereby making the world a better place. So maybe being taxed isn't such a sure thing after all. We'll let you know what we come up with for cheating Death. 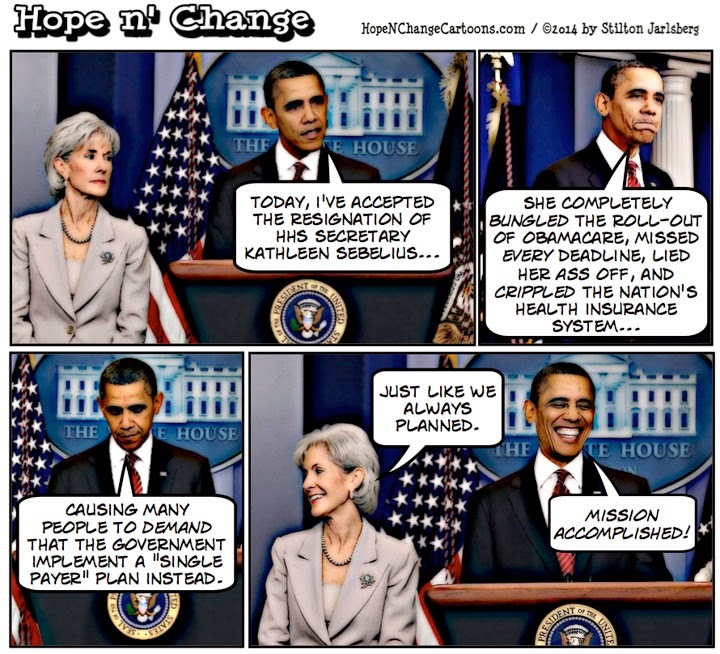 Hope n' Change doesn't actually have a lot to add to today's cartoon because it pretty much sums up exactly what we believe the Obamacare strategy to be - a deliberate fustercluck designed to force people into an unworkable system and destroy the private insurance agency. The eventual goal being a single payer system for everyone...and cost-saving euthanasia ("painkillers not pacemakers" in the president's words) for the old, infirm, and inconvenient. Sebelius will now join the teeming ranks of those who will be nearly impossible to hold accountable for their actions in this wretched administration, like Hillary "What Does It Matter" Clinton, Eric "Fast and Furious" Holder, and Lois "I Refuse To Even Admit That's My Name" Lerner. Obama's proposed replacement for Sebelius is Office of Management and Budget director Sylvia Matthews Burwell, who has no experience or expertise in Human Health Services whatsoever, but has a long history of sycophantic service to the Democrat party - demonstrated mostly by cooking the budget books, stonewalling Congress, and issuing the orders to barricade the WWII Veterans Memorial (and other open air national monuments) during the preposterous "government shutdown." With that kind of experience, erecting barricades between Americans and their health care should come as easily to her as it did to her predecessor.